Who in their right mind would have ever thought there would be a Kale Frenzy? For those who have been craving home-grown Kale chips now is the time to get the garden ready for growing a bumper crop of kale. Plant seeds now or find kale and other winter vegetables at your local nursery. Beets, cabbage, carrots, broccoli, lettuce, spinach, daikon radishes and of course, kale can all be planted and held in the garden through fall and winter and harvested in early spring when everybody else is just beginning their gardening year. Winter rains keep plants well watered. Insects like being outside about as much as we do so there aren’t many of them. Winter vegetables sold in nurseries should be the right varieties for wintering over. If you plant from seed, make sure you get seeds that are suited especially for fall and winter growing. More and more nurseries are carrying fall and winter vegetables. They are extremely easy to grow…mostly because you don’t have to do anything. 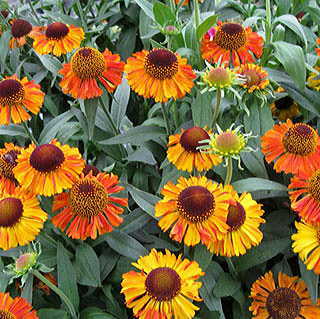 Helenium is also called “Sneezeweed”, not because of flowers and allergies but because the dried root was used for snuff. The most beautiful and reliable is H. ‘Sahin’s Early’. 3 feet tall and blooms, unstaked, for 2 to 3 months. Heliopsis means “sun-appearance”. Giant, floppy sunflowers are Heliopsis but there are some smaller garden worthy varieties. Heliopsis ‘Summer Sun’ is a 3 foot little yellow wonder that blooms a little earlier, June –August. It has sturdy stems and doesn’t require staking. 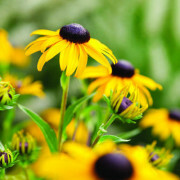 Rudbeckia or “Black-eyed-Susan’ types come in many varieties but the most well-behaved and long blooming is R. ‘Goldsturm’. It blooms heavily summer through fall and grows to 3 feet tall without staking. Heleniums, Heliopsis and Rudbeckia like full sun and not a lot of water. Deadheading makes them bloom even more. AND they’re good cut flowers and attract butterflies. Sometimes the “why I garden” books can be a little tedious. Gardening is such a personal endeavor and just about everybody has a book in them explaining why they garden. Garden memoirs can be syrupy sweet and well intentioned but they’re not exactly page-turners. 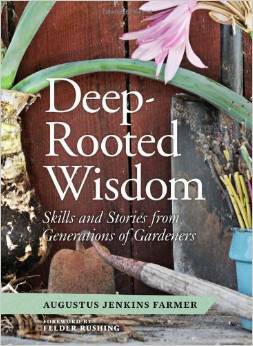 Happily, “Deep-Rooted Wisdom” by Augustus Jenkins “Jenks” Farmer keeps you turning the pages. “Jenks” Farmer is a Crinum lily grower in Columbia, South Carolina, with botanical gardens, city parks and private residences to his design credits. He shares his garden philosophies and doles out his very practical, commonsense gardening methods. Then he gives the credit to his the extraordinary people who taught him to garden.